Luigi Griffoni and Libero Piccini start producing, in Falconara Marittima (AN, Marche) a motorbike with the G.P. brand name. 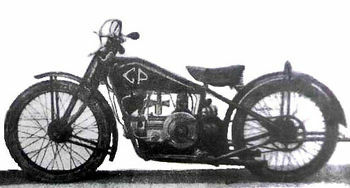 The patented engine was a single cylinder, mounted horizontally, with four strokes, 216 cc, bore and stroke mm 65 x 65, 2 HP, forced oil cooling, “Bosh” magneto, B.B. (Brown & Barlow) carburetor; it could run on gasoline or on naphtha (lighter fuel), with 90-95 km/h max speed on heavy fuel and 95-100 km/h on gasoline. Within the same 1927 year, the brand disappears from the market.